There are several Kickstarters big and small that I regret not backing over the last couple of years. Until my friend mentioned it last week Maelstrom might well have been another one for the list. However, now I'm in at the £30 level for a hardback rulebook and loads of extras from the stretch goals. Even if you never envisage playing the game, some of the extras and add-ons look like they would work well with other systems. 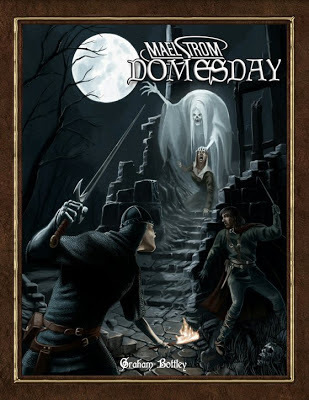 The Maelstrom RPG was first published in 1984 and remains a classic to this day. Fast and innovative mechanics, evocative characters, flexible magic and the preeminent RPG herbal made this a game ahead of its time. There isn't a retailer close enough to where I live to be my regular FLGS (Friendly Local Gaming Store). However, as it's Free RPG day I took a drive down to to Escape Games in Coventry. Their store is somewhat hidden above a Health Food store which you have to walk through to get access. That almost certainly means they get zero passing trade. However, because they put down some money to take part in Free RPG Day I now know about them and how to find them. If I lived locally I'd be very happy to spend long hours in there every other Saturday running games. I'd be delighted if a similar shop opened in Leicester (if one exists please let me know), but given the difficulties that all retailers in the UK face I can't see it happening unless a local gamer has a very big lottery win. Of the Free RPG goodies I got the LotFP, DCC and Swords and Wizardry adventures. 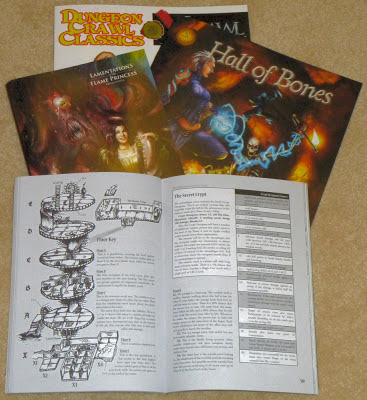 They all look great, but I think LotFP wins the day for giving away a book that probably has more content in it than all the other Free RPG day products put together. 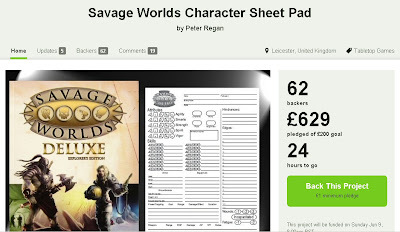 There's just 24 hours to go for my Savage Worlds Character Sheet Kickstarter. 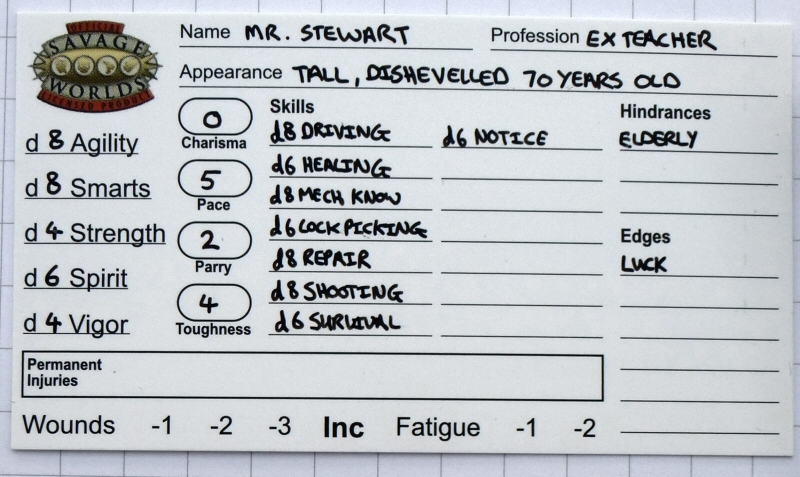 I'm really pleased with how it's gone, especially as we've reached the Stretch Goal that unlocked the Mini-Character Sheets. 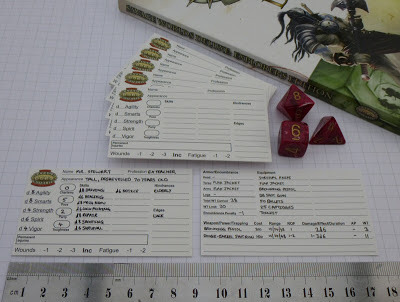 I got a welcome surprise today when my test print box of Mini-Character Sheet Cards turned up. I was hoping to get them by the weekend, but I only ordered them last Thursday so they were very quick. The main reason for doing a test print run of these is to check that everything fits on the card. The design really pushes the available "safe" print area on the card. 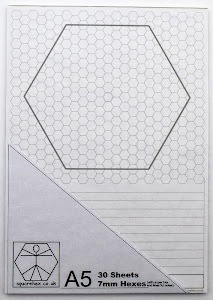 Thankfully, nothing was cropped, so I'm happy to place an order for how ever many thousands of them the project needs. As I type theres just under 5 days left and we're only £30 off the Stretch Goal that unlocks the cards. 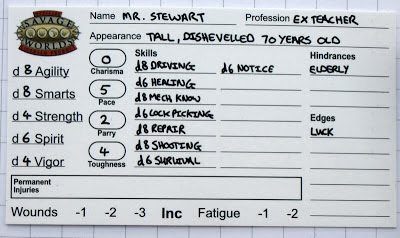 The card in the photo below features my current character who is part of a contemporary campaign (Warriors of Northwest Leicestershire 1978/2008) set in a post apocalyptic version of my gaming group's local area.